Ta daaaaah!!!!! Thanks to the enthusiastic number of comments on my weekend Facebook ‘win-a-cookbook’ promo, I am so happy to share one of my absolutely favourite recipes from Coming Unstuck – it is the ideal, super-easy, gather-the-troops for dinner dish, a perfect entertaining recipe for spring and summer, and one which I originally developed for Dish magazine. 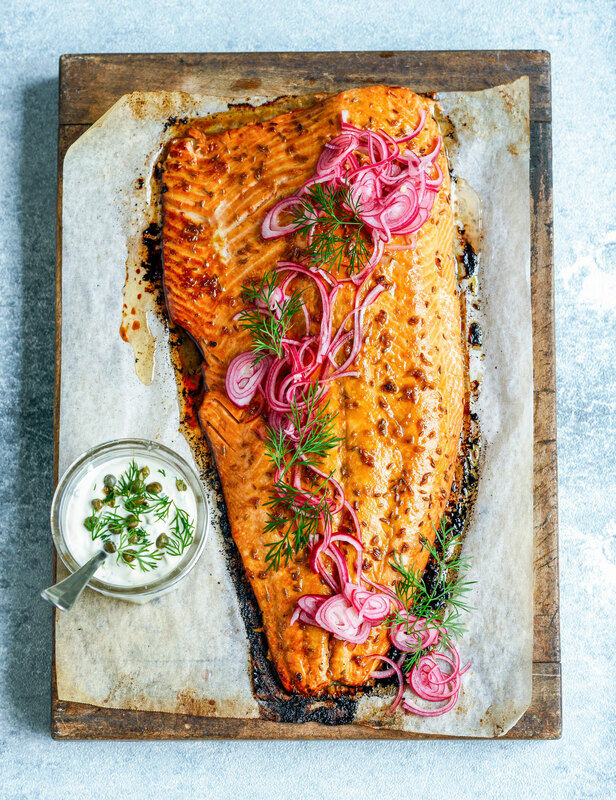 With a gorgeous pomegranate molasses glaze, the salmon’s served just-cooked, with a side of sharp, quick pickled red onion and a dollop of herby yoghurt mayo. I hope that it becomes as much of a go-to dish for you as it is for me. So…in other news, bloody hell I’m knackered, this launching a book business is pretty full-on, but also unbelievably rewarding. In the past couple of weeks I have received the most amazing messages from people, also going through crap, who have bought the book and are finding it a source of solace and connection. Seriously, some of you people made my eyes leak with your incredibly kind words. Then to top things off, I got an email from my distributor on Thursday to say that Coming Unstuck was sitting in the NZ top ten bestsellers list at number nine. What the hell? I always feel that I am invisible in terms of profile, (no one is going to give a sh*t if I do a faux baby news insta post – haha as if!) despite the fact that I contribute to Dish, Cuisine and Fairfax. So to think that the book, with it’s unassuming cover, by a relative un-known, has sold out in some places already blows my mind. I know that some people have found it hard to find – if so please contact your local Whitcoulls or Paper Plus store and invite them to order it, or failing that, homewares or gift stores, they can contact me directly and I will pass them on to my distributor. Of course you can also buy it here by hitting the BUY THE BOOK tab above. Put the vinegar and sugar in a small non-reactive bowl and whisk to dissolve the sugar. Add the onion, cover and refrigerate until ready to serve. Mix the olive oil with the garlic, pomegranate molasses and cumin seeds. Put the salt in a big roasting dish, deep enough to lay the salmon in, and with capacity for 6 cups of water. Add 1/2 cup boiling water to the salt and whisk to dissove it. Top up with 5 1/2 cups cold water and leave to cool. (I threw some ice cubes in to speed up the process). Add the salmon, flesh side down, and leave in the brine for 30 minutes – this will help to prevent the milky white fat from rising to the top of the salmon while cooking. Preheat the oven to 230˚C (450˚F) and line an oven tray with baking paper. Carefully remove the salmon from the brine and pat dry. Lay, skin-side down, on the baking paper. Brush the pomegranate molasses mixture over the salmon flesh. Bake for 10-15 minutes – I did 15 for my whopper, but if your salmon is smaller, stick to 12 minutes or less; you really don’t want to over-cook it! Leave to rest while preparing the yoghurt mayo. Mix the yoghurt, mayonnaise and lemon juice in a small bowl. Add the capers, dill, mint, salt and pepper, cover and refrigerate until ready to serve. For a little extra drama, a drizzle of pomegranate molasses swirled through the mayo looks great and is also delicious. The salmon can be served immediately once cooked, or refrigerated until half an hour before serving. To serve, garnish the salmon with the extra dill and drained red onion. Because the salmon is so tender I tend to leave it on the baking paper to serve and just slide a tray underneath to transfer the whole lot. If cooking well in advance, the salmon is easier to transfer without the baking paper if you prefer. So happy to hear about your success! Could this be done in the bbq?